This chapter concerns diseases that are frequent in clinic patients. The advanced IMBUS physician can offer these patients improved care, less resource use, and strong patient satisfaction. The danger lies in being only mediocre. These exam techniques and measures must be routinely performed on many patients without disease to gain and maintain the skill. IMBUS cannot see all parts of the proximal aorta. The best views for imaging the ascending aorta in long axis are a high-interspace PLAX and the apical3 while upper interspace PSAX and apical5 views can give a short axis measurement. The difference in aorta size between systole and diastole is small so just get the clearest image of the ascending aorta and freeze to measure. Enlarged ascending aortas are usually spotted immediately with the eyeball method, but it takes experience measuring aortas to develop this ability. With bicuspid aortic valves, only the beginning portion of the proximal aorta may be aneurysmal, but the most common aneurysms do not involve this portion but have dilation beginning more distally at the sinotubular junction. The IMBUS exam will use the “leading edge to leading edge” (LELE) method for measuring the aorta in all locations, including the ascending aorta. Measuring methods vary between labs, so expect variations of some millimeters between measurements and don’t think that these are real differences. LELE means the first caliper goes at the start of the hyperechoic anterior wall and the second caliper goes at the beginning of the posterior wall (end of the lumen). Even with views that are only fair, the aorta walls are echogenic and can be measured. Usually, just the ascending aorta is measured, unless the beginning aortic sinus looks much larger, when it would also be measured. Here is a typical PLAX view that allowed a good aorta measurement that was a little larger than normal. Next is a 48-year-old patient with a bicuspid aortic valve (AV) who characteristically had developed fairly early enlargement of his proximal aorta. Here is the PSAX cross-sectional measurement of the aorta from this same patient. Consider a patient’s height when interpreting the aorta size. Overall, aortic rupture is rare under 4 cm in average-sized adults. Aortic dissection can occur at any size. The descending aorta can often be seen, although not always well, in the PLAX, apical4, and apical2 views. Fortunately, enlarged descending aortas rarely occur in isolation from the ascending and an enlarged descending aorta becomes easier to see and can be measured. The supra-sternal view of the aortic arch is not easy and increasingly fails in elderly patients. Fortunately, the arch is also rarely enlarged in isolation so this view and measurement is not part of the IMBUS exam. Under-estimating severe aortic stenosis is an increasingly serious mistake as the ability to correct AS continues to improve. The rate of AS progression is unpredictable and patient symptoms are not reliable for indicating severe disease. Unfortunately, even expert echocardiographers, using just visual estimation of AS severity (degree of calcification and amount of valve opening), had a sensitivity of only 60% and a specificity of 85% for severe AS compared to full echocardiographic evaluation (Quader, et al. J Ultrasound Med, 2015). NOTE: The rest of this section concerns specifically measuring AV flow, but standard B-mode observations and measurements are still important for AV analysis. Careful assessment for LV septal hypertrophy, LV diastolic dysfunction, LV longitudinal systolic dysfunction, and LA enlargement are very important. A patient who lacks all these abnormalities would almost never have severe AS. This is important in those patients in whom the measurements of AV flow are suboptimal. The great majority of clinic AS patients are older with calcification of trileaflet aortic valves. In these patients, the severe AS is accompanied by severe sclerosis/calcification of the valve. Thus, observing only modest sclerosis of the AV in an elderly patient markedly lessens the chance of severe AS. However, severe calcification does not always mean severe AS. Here is a PLAX clip of a patient with obvious thickening and sclerosis/calcification of the AV along with some restriction to the opening of the valve, but this alone can’t determine the severity of the AS. Bicuspid AV disease is different in several ways. First, such patients develop trouble at an earlier age. Second, they can develop AS without having severe calcification. Third, they are much more likely to develop dilation of the aorta at an early phase of the disease. Thus, these patients need to be followed regularly from an earlier age focusing both on the AV and on the aorta. Distinguishing a bicuspid (or even unicuspid or quadrcuspid) AV from a trileaflet valve is often difficult, partly because the views of the valve in the upper PSAX may not be clear. Even with clear views, some bicuspid valves can appear trileaflet to routine eyeballing. But, statistically the vast majority of clearly trileaflet-appearing valves will be trileaflet. 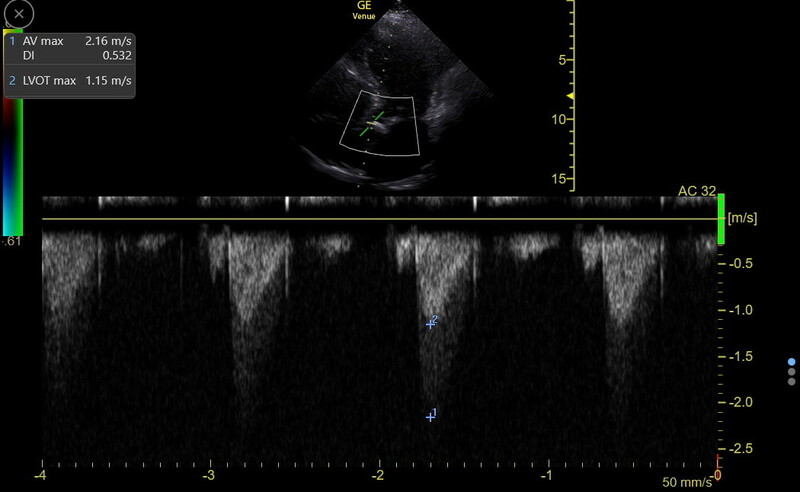 An apparent bicuspid valve in a patient in his or her 40s should always be confirmed by formal echocardiography. Here is a confirmed bicuspid aortic valve in the upper PSAX. In contrast, here is a nice trileaflet aortic valve in PSAX with a burst of central CD signal at the start of diastole that is central aortic regurgitation (AR). There is no single ultrasound measurement that reliably estimates AS severity. Valve area calculations are time-consuming and impractical for IMBUS. The measurements we need are Doppler flow velocities. It is adequate to measure only peak velocities without obtaining mean velocities (Finegold et al, International Journal of Cardiology, 2013). The first required peak velocity is right after the aortic valve (AV max). Because this post-valve velocity is > 2 m/sec in aortic stenosis, continuous wave Doppler (CW) is used. However, the CW cursor must be as parallel as possible to the blood flow or there is too much under-estimation of the velocity. The apical5 view is the most likely to get close to parallel for CW. Sometimes, the initial apical5 view shows the outflow tract and valve pointing off to the right on the screen as in the following clip. This clip would have benefitted from more gain. In such a situation, the LV must be moved or an RV enhanced view must be attempted, with the septum tipping to the left on the screen to see if this moves the outflow tract to a more vertical position. The following clip shows an apical4 moving to an apical5 with some modest leftward tilt to the septum. The outflow tract and AV come in at the end almost vertical. This is good alignment for CW. The following clip shows a typical magnified apical5 with the outflow tract about 15 degrees from vertical. The CW cursor and tracing should be acceptable in this situation. There is obvious AR in this clip. Some machines are able to angle correct with CW for up to 30 degrees away from parallel and this improves the accuracy of the velocity. With the outflow tract positioned, activate color flow Doppler (CF) and maximize the flow signal through the outflow tract and out the valve. Then place the CW gate with the focal point right after the aortic valve opening and activate it. Here is the tracing from the previous patient. The flow out the outflow tract and through the valve shows below the line because it is going away from the probe, so the baseline must be moved up. The Scale may also need adjustment. Then freeze the tracing in later expiration and measure the lowest point on the curve/spectrum/envelope. This is the peak velocity after the valve. In the patient above the peak velocity was 2.0 m/sec. Don’t measure a poor curve/spectrum/envelope. Be careful in patients with eccentric, medial MR jets because if the CW cursor is not completely parallel through the valve and LVOT, it might get into this left atrial flow, mimicking AS (although the shape of MR spectrum is different from the AS spectrum). If the CWD cursor is fully parallel through the outflow tract and the valve, such an MR jet could not be seen. Next is a tracing from a different patient with more severe AS. The curve/spectrum is clear and the peak measures at 3.4 m/sec. Long before there was technology in cardiology, master clinicians thought they could detect severe aortic stenosis with fingers on the carotid pulse. Pulsus parvus et tardus (small and slow rising) was the sought-after finding. While there is a method to measure the time to peak of the aortic flow, using the AV max tracing, we think we are better off looking at the corrected carotid flow time for a hint about delay in aortic/carotid output. In many patients, the AV max alone could be used to categorize the severity of AS, as in the following table. Dimensionless Index: Unfortunately, in an important minority of patients, the peak velocity can be misleading. This happens in patients with either reduced stroke volume (low flow/low gradient AS) or with increased stroke volume, including patients with moderate or greater AR. To avoid these traps, look at the ratio of flow velocity before the valve (LVOT max) to the velocity after the valve (AV max). This is called the “dimensionless index”. Sometimes, the orientation of the CW gate will go straight through the outflow tract and the aortic valve and the spectrum may then show both velocities in the same tracing, since CW is measuring all along the line. Here is the spectrum in a patient with confirmed moderate AS, an ideal CW alignment showing both curves, and a calculated dimensionless index of 0.33. It is probably best to use PW to measure the LVOT max, orienting the cursor parallel to flow and putting it just before the valve in the peak CF signal. Here is a distal outflow tract velocity measured with PWD. The large positive wave is AR. With some machines that have angle correctable CW gates, the apical 3 view might be used to get AV max and LVOT max measurements, but with fixed CW gate lines, it is usually impossible to get very parallel to flow through the outflow tract and valve. OUR OVERALL APPROACH TO AS: With a first diagnosis of AS in an older clinic patient with a sclerotic/calcified valve, a formal echo may not be needed if the views are good with a dimensionless index above 0.5 and all other evidence pointing to non-severe disease. If any finding points to disease worse than mild, a formal echo should be obtained for validation. If IMBUS findings are not validated by the formal study, the next few follow-ups should be done both in clinic and by formal echo to see if there is concordance. When an AS patient is followed in clinic for an interval check, a meaningful lowering of the dimensionless index or clear change in septal hypertrophy, LV function, or LA size should prompt formal echo to be sure about an important worsening of the AS. The criteria for replacing the AV in AS are in evolution and missing a worsening of disease is a potentially bad error. AR is common and important, but sometimes difficult to assess for severity. There isn’t a specific measurement, either caliper or spectral Doppler, to reliably determine if AR is severe. CF and other 2D information are used to assess severity. Important AR should have a hyper-dynamic LV and worry begins when the LV starts to dilate and develop decreased longitudinal systolic function. AR should be fixed while systolic function is still at least low normal. An increase in LA size is also a warning sign. The first evidence of AR may show with the anterior leaflet of the mitral valve in the PLAX view. A partially eccentric AR jet may cause fluttering of the leaflet. The fluttering may be subtle or prominent. Here is a clip of the PLAX view of a bicuspid AV patient with subtle anterior leaflet fluttering. There is also some sclerosis of the AV and at least mild restriction in AV opening. When the AR jet impinges strongly on the mitral leaflet, it can restrict the leaflet opening. This would be seen in an EPSS measurement. This pathology is also one theory of what causes the traditional Flint murmur of AR, a diastolic low-pitched rumble, like mitral stenosis. CF analysis of AR requires optimal size of the CF sector box. The sector needs to be large enough to cover a little distal to the valve on the aorta side and then down through the outflow tract. It should not cover much of the LA. Here is a CF sector that is too large for analyzing the AV. This examiner is trying to do the AV and MV at the same time, which is suboptimal. Next, the sector was changed to a better size for this outflow tract and AV. The sector needs to be wide enough to catch some eccentric jets that may only become visible further down the outflow tract. The AR jet is assessed with CF in the PLAX, PSAX, apical5, and apical3 views. Eccentric jets are particularly difficult to assess and tachycardia makes things more challenging. Sometimes the width and length of the AR jet can help categorize, but there are problems with this. ALIASING: This is the term used when a Doppler signal has gone beyond the Nyquist limits set for the exam type. With CF this helps our interpretation. If we see a uniform light blue or light red color without any mosaic of colors, the velocity of flow in the view is not high in the direction being studied. With high velocities, we see a mosaic of mixed colors. More important than the width or length of the AR jet are the characteristics of the jet’s origin. It is important to optimize the image and magnify before looking at the jet frame by frame. Look for the presence and size of a flow convergence zone (sometimes called PISA), which is the ball of color that accumulates on the aortic side of the valve. Also look at the width of the narrowest portion of the jet as it comes through the valve, which is called the vena contracta. Here is a diagram from 123sonography representing the characteristics of an AR jet. This table shows how the characteristics of the AR jet are used to determine the severity of the lesion. The jet width refers to the percentage of the outflow tract the jet occupies. Coanda effect: Eccentric, regurgitant jets that hug walls create something called the Coanda effect, which makes it hard to estimate the severity of the AR by jet length and width. Here is a PLAX clip from an earlier patient with fluttering of the anterior mitral valve leaflet. The clip is a little jerky, but there is a flow convergence zone on the aortic side of the valve and then the jet turns almost straight down onto the anterior mitral leaflet. The jet is aliased, so we know velocity is higher. The width or the length of the jet can’t be determined because it is a “wall-hugger”. The flow convergence zone and the aliasing suggest that this AR is at least moderate. In contrast, here is an AR jet in PLAX that is central, has no flow convergence zone, a pretty narrow width through the valve, and almost no aliasing of the jet. This all adds up to mild AR. The CF sector size was a little too tall for optimum visualization and the sector width could have been narrowed for better focus on the regurgitant jet. Here is a slightly better CF sector size and placement in another patient with mild AR. Here is the same patient as above with the overall screen sector narrowed and the depth decreased to optimize CF on the AR jet. Here is an apical4 that was initially misleading, because a red jet was seen going towards the apex of the heart in diastole, but arising about mid-ventricle. When the view was moved to an apical5, it could be seen that this was an AR jet that was hugging the septum and then curving out into the ventricle. Finally, the apical3 view can be important for assessing AR. Here is a clip from a patient with severe AR. The flow convergence zone is prominent, the vena contracta is wide, the jet is wide and long, and the jet is strongly aliased. Approach to AR: Surgery is indicated in AR patients when the ventricle begins to dilate and LV function starts to deteriorate to mid or low normal. The LVEDD and MAPSE need to be watched carefully. The severity of the AR jet itself can vary as a patient’s preload, afterload, and contractile state vary. When the LVEDD increases and becomes greater than normal for height, LV longitudinal function decreases, or the LA begins to enlarge, a formal echo is needed to be sure an AR patient is corrected at the optimal time.